On the friendly hotel concierge’s suggestion we ate close-by in a great locals-frequented restaurant, called Búlivar. For 16 euros we were served a 3-course meal in addition to an appetizer and a whole bottle of wine! Best flan (large piece of something like, but better than, crème brûlée) I’ve ever eaten. And we had a genial and helpful waiter to do it. The staff were all very professional and treated me like family. The rooms were clean and location was very near the Metro. The facilities were great, location perfect. The staff helpful. A great place to stay. The location was excellent.Close to metro station, 10 mins to city center and 30 mins to airport. Room big enough to include a settee. A real comfort after the full day of sightseeing. Spacious, good furnishings, reasonable security, good swimming pool and sundeck,location amongst local people (no tourists) Very close to 4 metro stations, Supermarket and Domino pizza next door, plenty of restaurants, About 3km walk to the city, 1km to a major bus terminal with direct bus to Airport. Pool area nicely renovated. . The location: proximity of the subway is a plus (even though the #5 line was not operating during our stay). The supermarket downstairs makes some meals easy. The cafe next door is new since my last visit and is pleasant. A particular staff member was very welcoming and helpful. The apartment style unit was very convenient, comfortable and great value for money. Location was perfect as we were visiting family. The man at the front desk was a delight. The concierge was nice. They made sure we were in a non-smoking room. Lock in a great price for Apartamentos Juan Bravo – rated 8.3 by recent guests! 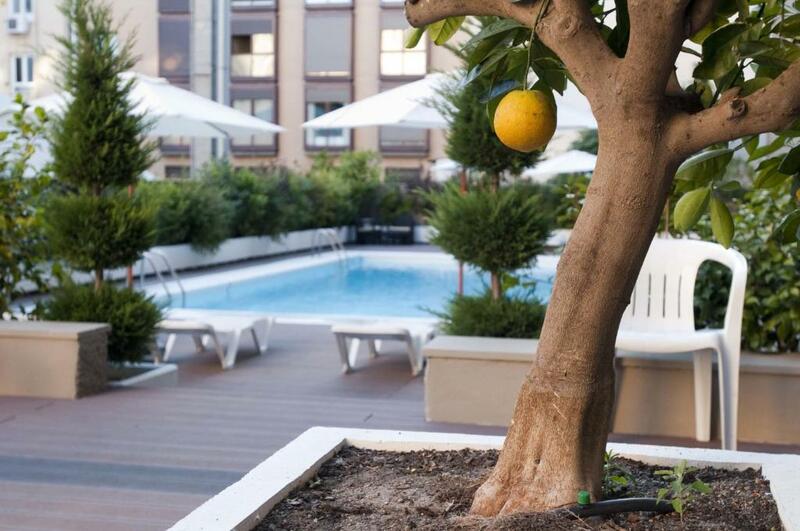 The Juan Bravo Apartments are situated in the exclusive Salamanca district of Madrid and feature a communal swimming pool, open in summer. Diego de León Metro Station is located across from the apartments. The complex conveniently includes a 24-hour front desk. The apartments and studios are arranged around the pool, and there is also a small garden and patio. All accommodations include a lounge area and TV. Apartamentos Juan Bravo feature a kitchenette equipped with a microwave and fridge. They also have a private bathroom. Many bars, restaurants and supermarkets can be found in the surrounding streets. The M30 and M40 Motorways are just a 2-minute drive from the apartments, providing easy access to other cities. Barajas Airport is a 15-minute drive away. Parking is available on site for an extra fee. 뀐 Located in the top-rated area in Madrid, this property has an excellent location score of 9.0! When would you like to stay at Apartamentos Juan Bravo? This air-conditioned studio features 2 single beds which can be joined together. It features a seating area with TV and a kitchenette with microwave and fridge. Private parking is available at a location nearby (reservation is not possible) and costs EUR 21.78 per day. All our apartments feature a kitchenette equipped with a microwave and fridge so it´s a perfect option to stay in the city with the independence of feeling like home. Our apartments also offer a communal swimming pool, open in summer which definitely is an asset during hot days. Experienced, efficient and friendly team whose aim is to make you feel very comfortable while staying with us. Located in one of the most prestigious districts of the city, Salamanca full of restaurants and shops. Almost in the apartments entrance you find metro station Diego de Leon which takes you to the city center in 10 minutes. Area Info – This neighborhood is a great choice for travelers interested in shopping, restaurants and culture – Check location Excellent location – show map Guests loved walking around the neighborhood! House Rules Apartamentos Juan Bravo takes special requests – add in the next step! Apartamentos Juan Bravo accepts these cards and reserves the right to temporarily hold an amount prior to arrival. Please note that the maximum occupancy cannot be exceeded, children are count as adults. Please note that the apartments are cleaned once a week and towels are changed on the the fourth day. Please note that the air conditioning in the rooms is available during the summer season, from 10:00 until 23:00. Please note that heating in the rooms is available during the winter season, from 09:00 until 00:00. The complex's swimming pool is open from 15 June until 15 September. Payment will be taken upon arrival. Please note that parking cannot be reserved in advance and is subject to availability on the day of arrival. Size and comfort of bed. N/A Breakfast not available, but there were many many cafes and restaurants in easy walking distance that gave so many different options for breakfast. Wi Fi. The conexion in the room (515) was on /off very often. Great neighbourhood - close to the Metro, shops and restaurants. It is a nice place to choose. The rest room is clean. The bed is clean and comfortable. I highly recommend. The night receptionist was great and very helpful. The management accommodated our change of dates with no problems. Plenty of lifts. Parking is good but expensive though. Supermarket just below apartment is a big bonus. Its clean. Metro and bus stop around the corner. Pleasant area with restaurants and supermarket next door. Only few stops to city center. Everything perfect, great location, close to metro,shops, restaurants. Modern accomodation, perfect pool. The appartment was overall good but the single bed are way too small. I am 187cm and I could not fit within the bed. Shoud be upgraded. The pool area does not open until 11am! I found this to be quite late. This is not the hotels fault but there is extensive work going on with the metro (until September) which made getting into the city more difficult and time consuming. We found taking a Uber was the cheapest at €6 one way and took around 10 mins. Okay apartments, well equipped but little daylight gets in due to the room we were in was just over looking another high rise block, making the room dull. The apartments are very clean and are cleaned every 4 days along with fresh towels and linen. The pool was nice and lots of sun loungers with sun beating down all day. There are lots of nice places to eat and also a supermarket right next to the apartment. All in all a very nice stay. From the airport take bus 51 it takes 16 mins and costs €1.50, get off at the last stop. You can then walk to the apartments (I stopped and asked a couple of times different people) which took 10 mins to walk or jump straight on the metro.